Do you find your conservatory can fluctuate in temperature depending on the time of year? 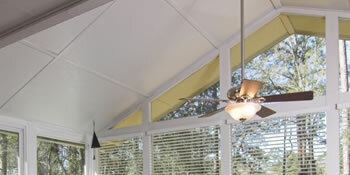 It’s a common problem that homeowners endure a hot conservatory in the summer and a cold one in the winter. But this no longer has to be the case. If your conservatory has been suffering from mixed temperatures, it’s past time to consider a new roof to give you better climate control. With a new roof you’ll be able to completely transform the conservatory and create an environment you can enjoy no matter the time of year. Most conservatories are standard installed with a polycarbonate roof, but over the years these have proved to be unreliable and ineffective at controlling your home’s temperature. Even glazed roofs, which are slightly better, still don’t give you a space to relax in throughout the year. Essentially, solar heat is conducted into the conservatory in the warmer months, so it’s too hot for use. In the winter, poor insulation results in heat loss, so either you pay more on your bills heating it up, or you suffer in cold. This is where modern conservatory roofing systems come into the equation. They can be installed with minimal disruption to you and will instantly transform the conservatory. What’s more, the conservatory’s shape won’t need to be changed in the slightest either. ]Slate roofing for the conservatory is by far a huge improvement and has a number of unique benefits such as its aesthetic appeal and durability. There’s no denying these slate roofs look terrific and they match your home’s appeal to. With this lightweight conservatory roof you can really start to enjoy your conservatory once again. For up to four free quotes, just complete our quick online form. It couldn’t be easier and we’ll match you with professionals near you. Very helpful and professional. Repaired slipped glass on conservatory roof. Contacted us but we had already been contacted by Conservatory Roof Supplies Ltd.
Quotatis came up with five suppliers of high repute very quickly. Properties are given an energy score based on how efficient they are and ratings are displayed in the information underneath. This varies from A, the most energy efficient, to G, the least efficient. With a higher rating you're more likely to have cheaper energy bills as more heat shall be kept in the house. You are able to increase your home's efficiency with insulation including upvc double glazing, loft lagging or wall cavity insulation. There are several types of property in the United Kingdom and the info below illustrates the type of housing within Uk. Throughout the country the most common property types tend to be semi-detached and terraced housing, yet detached homes, flats and bungalows are also available. The pie chart beneath shows the proportion of households in Uk which are central heated and non-central heated. Central heating figures in the the vast majority of UK households, such as those on the gas grid and properties heated by oil and electric. The data underneath illustrates the spread of households warmed by various fuels. Throughout the United Kingdom the most common by far are gas heated properties, followed by electricity and then oil. Biomass boilers are also increasing in popularity, heated by eco-friendly products like wooden pellets or agricultural waste.|Homes in the UK are heated up by a variety of fuels, such as gas, electricity, oil, solid fuel and LPG boilers. Each fuel has a varying cost associated with it which means you can find yourself with less expensive energy bills by altering how your home is heated. Even solar thermal panels are being regarded as by many people in order to cut heating bills for the years to come.